- Keith Roberts from The Valley Hive came to the house with a honey extractor which he set up in the kitchen. - We suited up. 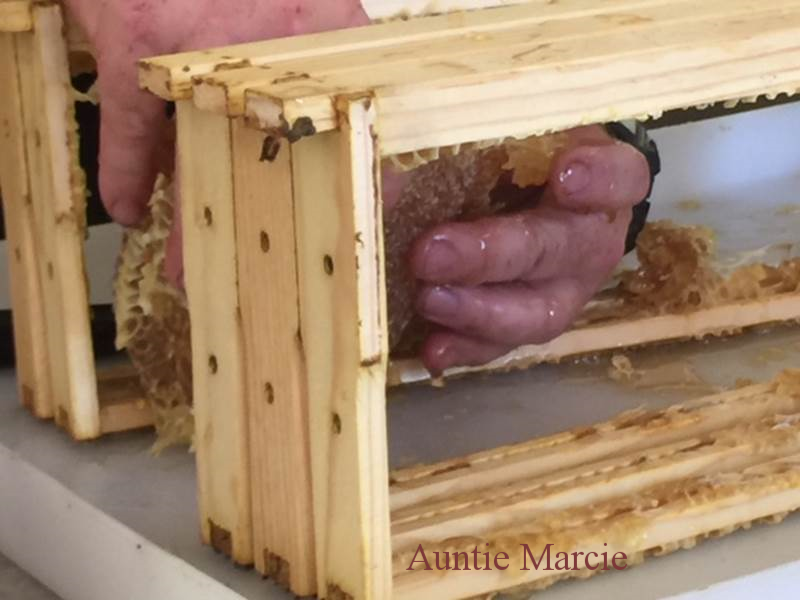 We removed the wooden and plastic honey combs from the ‘honey super’ (the top tier of the hive the queen can’t enter-so no babies up there) and brought them into the kitchen. They were heavy. (Click pictures below for a slideshow). - We cut out the honey comb with a knife from three of the wooden combs. I wanted some like that so that I could put some honeycomb into each jar of honey. I wanted some for centerpieces, and for parties. To keep the combs, I had to be freeze them for 24 hours to kill any potential live contaminents. They are now in my fridge. 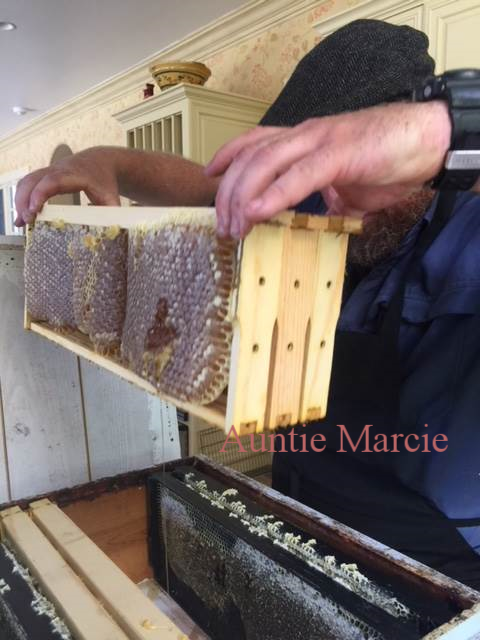 - Keith used an electric knife to cut protruding comb from the front surface of the plastic combs and a wire fork to prick the back side of the honey combs open. They honey can’t drain out unless the surfaces are cut open. - Three plastic combs are inserted into the extractor at a time. It spins to use centrifugal force to extract the honey. 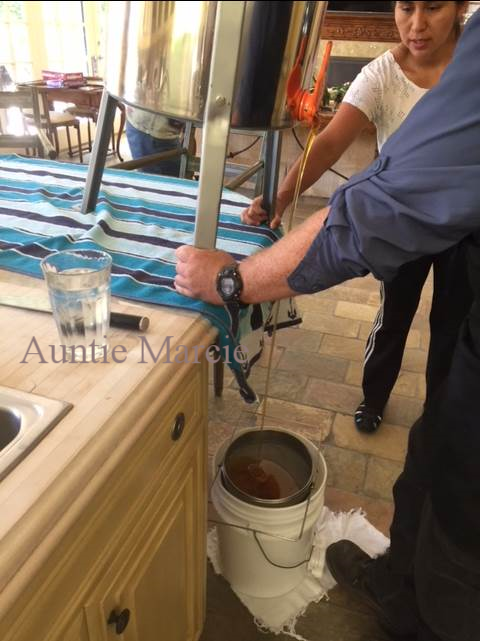 - We put the honey through a strainer into a bucket with a spigot. - We filled the jars. Our extraction day yielded approximately 15 pounds of honey. Two jars went into Keith’s Honey Competition…Keith advised that our 8.5 oz. jars would sell for $17-20 each and our 1 oz. jars would sell for $5. Of course, none of them are for sale!! This is a photo of the original hive in the chicken coop roof. Notice how the bees original architecture mimics the vertical slats in the hive box.